Some helical pier installations pose extremely limited access and major mobilization issues. Inside work, such as basements or crawl spaces, are examples of these types of challenges. 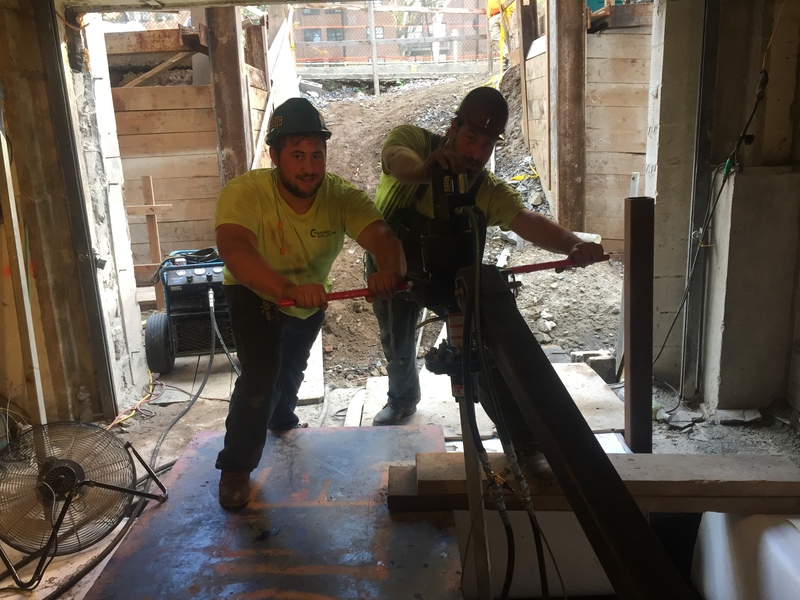 Danbro offers portable, hand-held helical pile installation equipment components and provides specialized training to ensure a safe and successful installation. The portable unit consists of a drive head with the appropriate drive tool, an extendable reaction bar to resist the torque, and a hydraulic foot pedal control valve. For shaft-driven guy anchors and smaller screw foundations, these compact drivers are ideal when ease of access for large equipment is not available. Hand-held portable units need to be used with the utmost skill and caution. Special training is required to utilize this unique helical installation methodology. Most of our installers do not have portable hand-held units. The installations are slow and labor-intensive, and, therefore, more costly than a similar installation with an excavator-mounted drive string assembly. Contact Danbro to receive a referral to a seasoned, well-trained installer, capable of utilizing this system. Whether you are working on a remote site or working in tight quarters, Danbro has you covered. The portable, manually-operated drive head and accessories allow you to get into areas where larger equipment can’t reach. A torque bar is attached to a restraint or secured to the earth to transmit counter-torque during operation. The operator does not need to guide the anchor path or resist the torque generated by anchor installation. Output is limited to 2,500 to 6,500 ft. lbs. maximum via the built-in bypass valve. A two-way foot pedal provides the operator direct control over drive and reverse directions. Four hoses, two 12′ and two 25′, are attached with quick couplers for all connections from power supply to foot control to drive head. A pivoting drive-head yoke connects with a bent-arm pin to a square-tubular torque bar, which telescopes from 8′ to 10′ as needed.